Calendar of Treasury Papers, Volume 2, 1697-1702. Originally published by Her Majesty's Stationery Office, London, 1871. 1. Letter from Mr. James Vernon to the Lords of the Treasury, signifying the King's pleasure that 500l. should be paid to Mr. Paul Methuen, his envoy extraordinary at Lisbon, as was allowed him by the King's privy seal on account of his equipage. His Majesty thinking this allowance so much the more reasonable, since the late envoy, his father, had made no demands for the charge of his return from Portugal, nor had anything been given to the son to carry him thither. Dated 18 July '98. In the Minute Book, Vol. X., p. 36, for that day, is:—“Mr Methuen 500li. Respited.” 1 page (quarto). Also copy of the regulation of subsistence to be paid weekly for the use of those regiments from the same day. 2 pages. These contain abstracts of about 140 petitions and reports, against each of which, in the margin, is the minute of what the King ordered to be done; also in Mr. Lowndes' hand. With these is a smaller paper, also in Mr. Lowndes' hand, containing copies of the same minutes. Three very large pages (one torn) and 1¼ pages of smaller size. 4. Letter of the Comrs of the Navy to Mr. Lowndes, as to abuses committed in the New Forest in embezzling wood, &c. Dated 18 July '98. With an enclosure. 2 pages. 5. A paper, without title, commencing abruptly, consisting of resolutions as to the supply of the household, allowances to the cofferer and other officers. Minuted:—“Read 18 July '98. The K. approves this.” 1 page. 6. 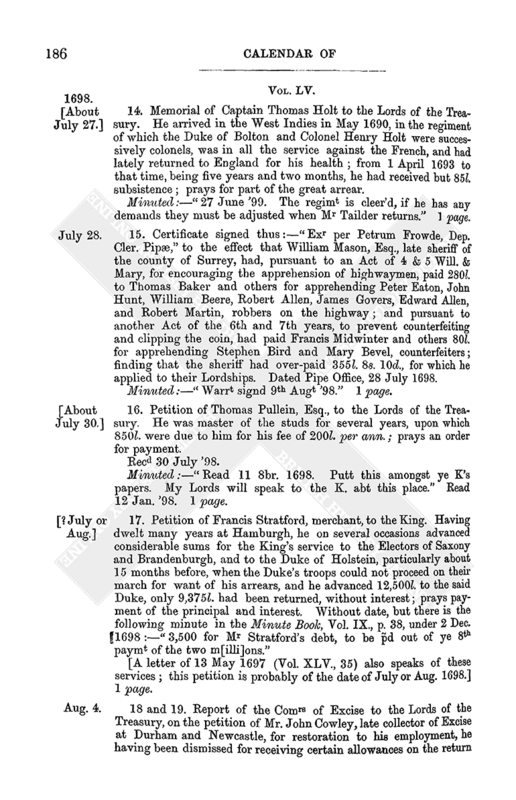 Report of the Comrs of Customs to the Lords of the Treasury, on the petition of Thomas Rowe, and on directions from their Lordships, to examine what employment he was qualified for; advising that as he had some legal attainments he would make a good assistant to Mr. Baker, if he should require help. Dated 18 July 1698. 7. 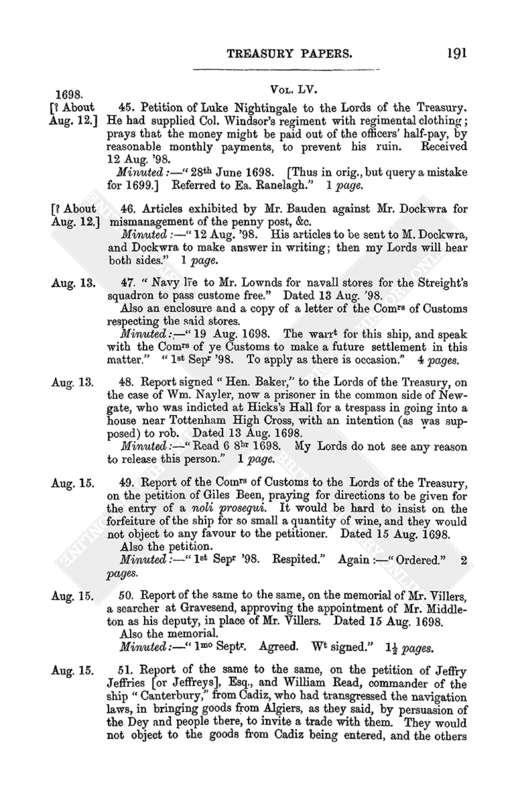 Report of the Comrs of Customs to the Lords of the Treasury, on the petition of Joseph Chamberlain and John Tidecombe of London, merchants, praying that a noli prosequi to the information exhibited against them might be entered; referring to their former report on the same subject, since which a licence of the Court of Exchequer to compound had been brought; viz., by paying a third, being upwards of 400l. : the King was entitled to an equal fine, unless their Lordships should remit it. Recommending the petitioners to their Lordships' favour. Dated 18 July 1698. The petition, the report referred to, and a certificate. Minuted:—“Agree with the report. Wt signed 10th Novr 1698.” 5 pages. 8. Petition of Robert Sakar to the Lords of the Treasury, for payment of 40l. for apprehending and prosecuting one Richard Jeovon and others, for counterfeiting the current coin. Also an order thereon. Dated 20 July 1698. 2 pages. 9. Presentment of the Comrs of Customs to the Lords of the Treasury, laying before them the copy of their presentment of 27 June last, as to several ships of great burthen preparing to be sent with soldiers and tradesmen from Scotland, as was supposed for the northern parts of America. Dated 21 July 1698. The copy of the said presentment and the copy of the letter of their agent at Leith, in reference to the same. He states that it was thought the vessels would touch at the Madeiras, and would go about the north of Scotland, where they would meet the ship “Rising Sun” coming from Rotterdam. They talked of Jamaica and Crab island lying 17 lat. east of Barbadoes, St. Thomas within three leagues of Golden island (alias St. Andrews) in America, upon the coast of Spain, 70 leagues from Jamaica to the southward, called the Spanish Indies. They also talked of Tobago, 11 or 12 degrees to the southward of Barbadoes, &c.
[? The Darien expedition.] 3¼ pages. 10. Memorial from the Comrs of Excise to the Lords of the Treasury, for a warrant to allow the collectors of excise certain losses on the reception of gold coin in their collections. Dated 22 July 1698. 11. Letter of the Comrs of the Navy to Mr. Lowndes, respecting money to pay the ships ordered on foreign voyages, and those ordered to be laid up. Dated 26 July 1698. Minuted:—“Memd to take notice of ye last line when the Comrs come.” 1 page. 12. Report of the Comrs of Prizes to the Lords of the Treasury, on the petition of Thomas Langham, who had purchased certain goods and a ship, for the former of which he had paid to the Receiver-General of Prizes; but as he failed to pay for the latter, it was put up for sale again, and was sold at a loss of 160l. with which the petitioner was chargeable: informing their Lordships that they must prosecute him unless they ordered prosecution to be stopped. Dated 26 July 1698. Minuted:—“The petr to be relieved. Wt signed 27 7ber 1698.” 2 pages. 13. “Allowances to officers of the 2 Houses of Parliamt, and what remains due thereon.” Dated 26 July '98. 1 page. 14. Memorial of Captain Thomas Holt to the Lords of the Treasury. He arrived in the West Indies in May 1690, in the regiment of which the Duke of Bolton and Colonel Henry Holt were successively colonels, was in all the service against the French, and had lately returned to England for his health; from 1 April 1693 to that time, being five years and two months, he had received but 85l. subsistence; prays for part of the great arrear. Minuted:—“27 June '99. The regimt is cleer'd, if he has any demands they must be adjusted when Mr Tailder returns.” 1 page. 15. Certificate signed thus:—“Exr per Petrum Frowde, Dep. Cler. Pipæ,” to the effect that William Mason, Esq., late sheriff of the county of Surrey, had, pursuant to an Act of 4 & 5 Will. & Mary, for encouraging the apprehension of highwaymen, paid 280l. to Thomas Baker and others for apprehending Peter Eaton, John Hunt, William Beere, Robert Allen, James Govers, Edward Allen, and Robert Martin, robbers on the highway; and pursuant to another Act of the 6th and 7th years, to prevent counterfeiting and clipping the coin, had paid Francis Midwinter and others 80l. for apprehending Stephen Bird and Mary Bevel, counterfeiters; finding that the sheriff had over-paid 355l. 8s. 10d., for which he applied to their Lordships. Dated Pipe Office, 28 July 1698. Minuted:—“Warrt signd 9th Augt '98.” 1 page. 16. Petition of Thomas Pullein, Esq., to the Lords of the Treasury. He was master of the studs for several years, upon which 850l. were due to him for his fee of 200l. per ann. ; prays an order for payment. Minuted:—“Read 11 8br. 1698. Putt this amongst ye K's papers. My Lords will speak to the K. abt this place.” Read 12 Jan. '98. 1 page. [A letter of 13 May 1697 (Vol. XLV., 35) also speaks of these services; this petition is probably of the date of July or Aug. 1698.] 1 page. 18 and 19. Report of the Comrs of Excise to the Lords of the Treasury, on the petition of Mr. John Cowley, late collector of Excise at Durham and Newcastle, for restoration to his employment, he having been dismissed for receiving certain allowances on the return of the money collected for Excise: advising his re-employment, Dated 4 Aug. 1698. The petition and an affidavit relating thereto. 4 pages. 20. “An estimate of ye debt of His Maties navy on the heads under-mentioned, as it stood on ye 30th June last past.” Dated 4 Aug. 1698. The heads are:—Wear and Tear, Seamen's Wages, Victualling, Sick and Wounded, Register Office. The total was 2,419,035l. 1 page. 21. Letter of Mr. Wm. Blathwayt to Mr. Lowndes, returning his warrants signed according to his desire; he almost thought it unnecessary to put him in mind of the tallies or payment he gave him leave to expect upon his (Mr. Blathwayt's) warrant of Secretary of State. It was what he designed for his “new subscription.” Dated Loo, 4/14 Aug. 1698. 1 page (quarto). 22. Letter of the Comrs of the Navy to Mr. Lowndes, enclosing an estimate of the debts of the navy. Dated 5 Aug. 1698. [The estimate not now with it.] 1 page. 23. 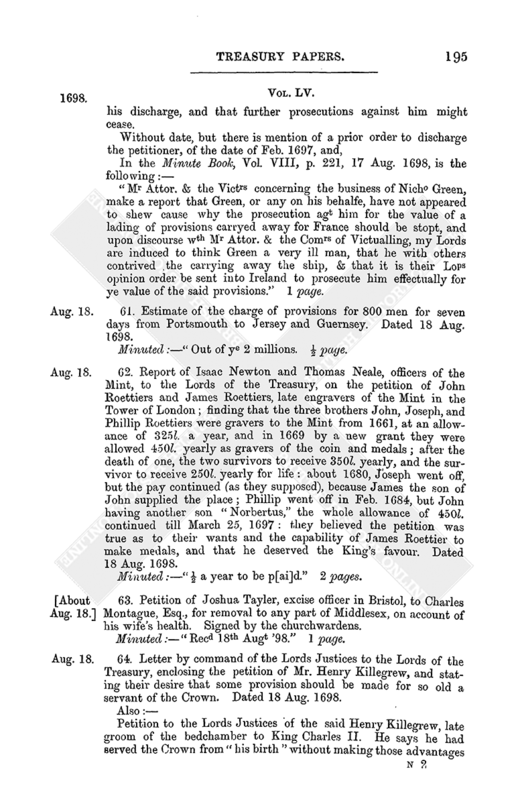 Copy (from the Prize Office book) of report on the petition of Captain James Moodie, who had given bond for 470l. 4s., being the produce of two prizes, 266l. 14s. of which he refused to pay, alleging that Capt. Rigby detained certain sums for which the petitioner craved allowance. Dated 6 Aug. 1698. Minuted:—“8 9br. '98. Allow the p[er]ticulars in Rigby's hands to Moody, & deliver up the bond, but Comrs of Prizes must take care to prosecute Rigby. Wt signed 10th Novr 1698.” 1 page. 24. 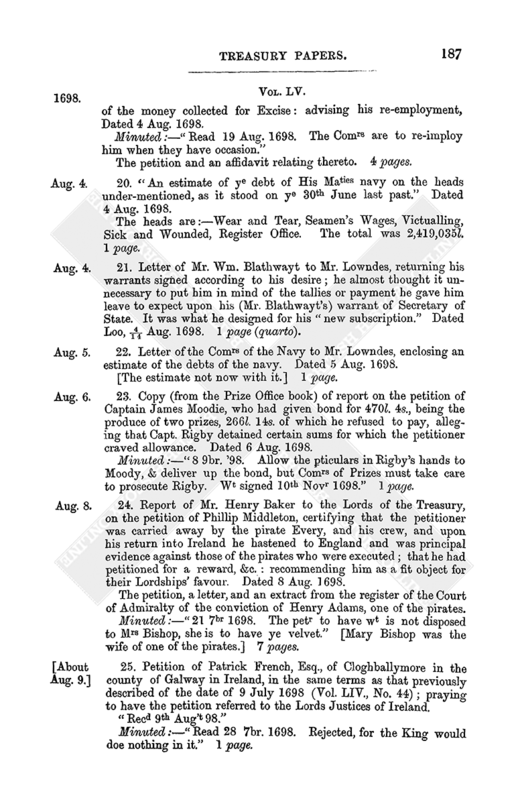 Report of Mr. Henry Baker to the Lords of the Treasury, on the petition of Phillip Middleton, certifying that the petitioner was carried away by the pirate Every, and his crew, and upon his return into Ireland he hastened to England and was principal evidence against those of the pirates who were executed; that he had petitioned for a reward, &c.: recommending him as a fit object for their Lordships' favour. Dated 8 Aug. 1698. The petition, a letter, and an extract from the register of the Court of Admiralty of the conviction of Henry Adams, one of the pirates. Minuted:—“21 7br 1698. The petr to have wt is not disposed to Mrs Bishop, she is to have ye velvet.” [Mary Bishop was the wife of one of the pirates.] 7 pages. 25. Petition of Patrick French, Esq., of Cloghballymore in the county of Galway in Ireland, in the same terms as that previously described of the date of 9 July 1698 (Vol. LIV., No. 44); praying to have the petition referred to the Lords Justices of Ireland. Minuted:—“Read 28 7br. 1698. Rejected, for the King would doe nothing in it.” 1 page. 26. 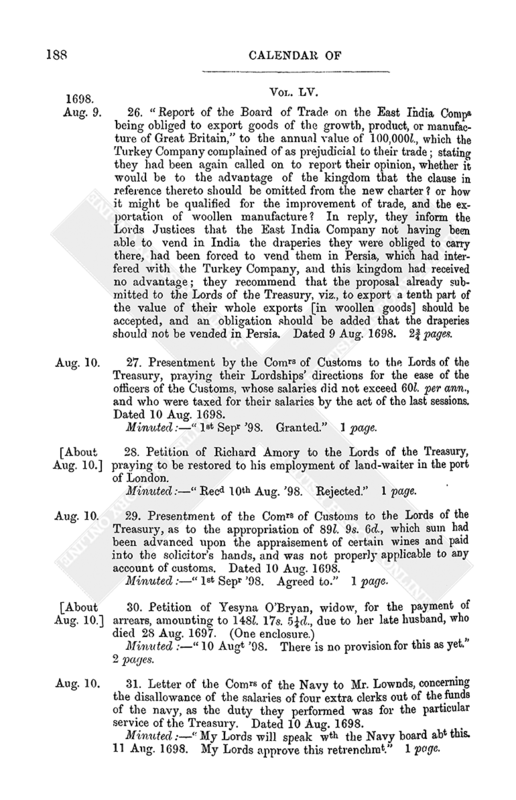 “Report of the Board of Trade on the East India Compa being obliged to export goods of the growth, product, or manufacture of Great Britain,” to the annual value of 100,000l., which the Turkey Company complained of as prejudicial to their trade; stating they had been again called on to report their opinion, whether it would be to the advantage of the kingdom that the clause in reference thereto should be omitted from the new charter? or how it might be qualified for the improvement of trade, and the exportation of woollen manufacture? In reply, they inform the Lords Justices that the East India Company not having been able to vend in India the draperies they were obliged to carry there, had been forced to vend them in Persia, which had interfered with the Turkey Company, and this kingdom had received no advantage; they recommend that the proposal already submitted to the Lords of the Treasury, viz., to export a tenth part of the value of their whole exports [in woollen goods] should be accepted, and an obligation should be added that the draperies should not be vended in Persia. Dated 9 Aug. 1698. 2¾ pages. 27. Presentment by the Comrs of Customs to the Lords of the Treasury, praying their Lordships' directions for the ease of the officers of the Customs, whose salaries did not exceed 60l. per ann., and who were taxed for their salaries by the act of the last sessions. Dated 10 Aug. 1698. Minuted:—“1st Sepr '98. Granted.” 1 page. 28. Petition of Richard Amory to the Lords of the Treasury, praying to be restored to his employment of land-waiter in the port of London. Minuted:—“Recd 10th Aug. '98. Rejected.” 1 page. 29. 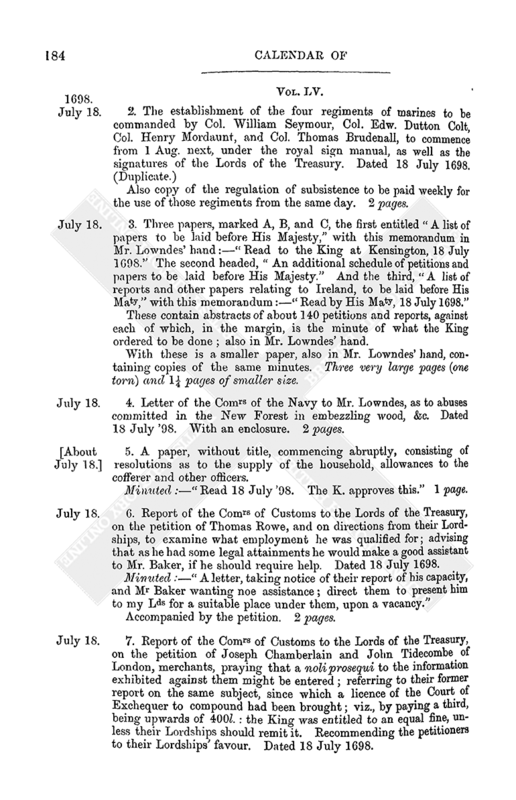 Presentment of the Comrs of Customs to the Lords of the Treasury, as to the appropriation of 89l. 9s. 6d., which sum had been advanced upon the appraisement of certain wines and paid into the solicitor's hands, and was not properly applicable to any account of customs. Dated 10 Aug. 1698. Minuted:—“1st Sepr '98. Agreed to.” 1 page. Minuted:—“10 Augt '98. There is no provision for this as yet.” 2 pages. 31. Letter of the Comrs of the Navy to Mr. Lownds, concerning the disallowance of the salaries of four extra clerks out of the funds of the navy, as the duty they performed was for the particular service of the Treasury. Dated 10 Aug. 1698. Minuted:—“My Lords will speak wth the Navy board abt this. 11 Aug. 1698. My Lords approve this retrenchmt.” 1 page. 32. “The particulars of the discovery late of William Adderly, proposed in the petition of Richard Heath, merchant,” delivered in to the Lords of the Treasury. The discovery relates to a messuage called Cook Hall, and lands belonging, in the parish of Careswell in the co. of Stafford, and land near Cheadle. Minuted:—“Ref. to agts for taxes.” 1 page. 33. An account of tallies, malt lottery tickets, &c. remaining the 10th of August 1698 in the Treasurer of His Majesty's navy's hands unapplied. 1 page. 34. Great wardrobe. A particular of several extraordinary provisions for His Majesty's service since Mich. 1697. Dated 10 Aug. 1698. 2 pages. 35. 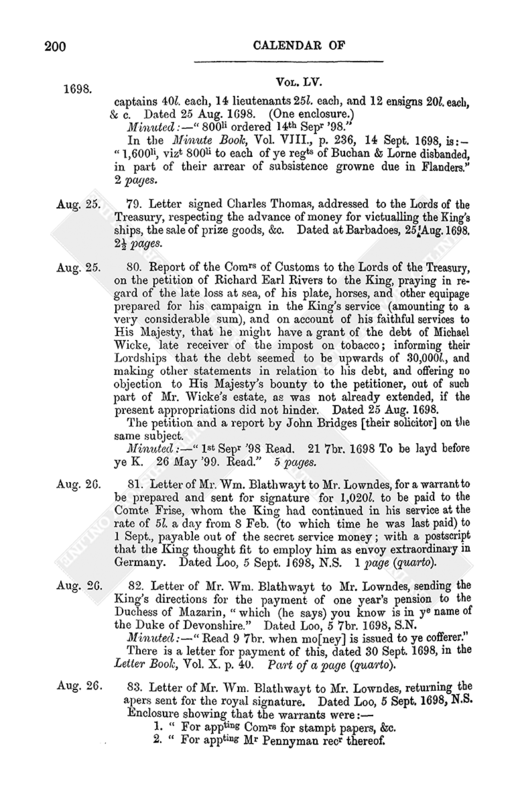 Report of the Comrs of Customs to the Lords of the Treasury, on the petition of Thomas Walsh of London, merchant, a debtor to the King for the impost on tobacco for upwards of 2,000l., praying them to accept of so much as was already assigned in satisfaction of the debts; referring to the solicitor's report thereon, and advising that they could not discover any further security than what was already possessed. Dated 10 Aug. 1698. The petition and the report of the solicitor thereon. Minuted:—“1st Sepr '98. The petition is dismist.” 4 pages. 36. Petition of Nathaniel Booth, Esq., to the Lords of the Treasury, praying that the arrears of his salary as Surveyor of Fines, called Green Wax, estreated in the Court of Exchequer, might be satisfied. Received 10 August '98. Also a certificate from the Pipe Office thereon. Dated 1 Aug. 1698. Minuted:—“A warrt for the first two years to be p[ai]d at ye Excheqr.” 2 pages (decayed on the left margin). 37. Report of the Comrs of Customs to the Lords of the Treasury, on the memorial of the Comrs for Victualling the Navy, relating to the “William,” (hoy), seized and condemned at Sandwich; referring to their former memorial, in which they were jealous of collusion between the officer and the merchants to import the wines upon easier terms; also referring to their presentment, moving that the matter might be laid before the Court of Exchequer for a remedy; whereupon the King's attorney had leave to take the King's part in kind, or to have a new appraisement. The Comrs took it in kind and it sold for 50l., being 12l. in advance of the appraisement. The vessel was omitted in the said motion, or it might have been 10l. or 15l. to the King's advantage. Dated 10 Aug. 1698. Also the document referred to. Minuted:—“Read 16 Aug. '98. My Lords can give no further direction in this.” 6 pages. 38. Letter signed Wm. Blathwayt to Mr. Lowndes, sending by the King's command, a memorial of Lord Lucas, Governor of the Tower, which he had sent to the King; His Majesty's pleasure was that the 300l. therein mentioned should be repaid to him. Dated Loo, 11/21 Aug. 1698. Also the memorial. 1 page and 5 lines. 39. Letter of Mr. James Vernon to Mr. Lowndes. Mr. Blathwayt had sent him the enclosed regulation of subsistence for the marine regiments, with the King's directions that it might be countersigned, as the establishment lately was. Dated 11 Aug. '98. In the Minute Book, Vol. VIII., p. 224, 19 Aug. 1698, is:—“3 new marine regts of Seymour, Colt, & Mordant to have 892. 3. 0. for 14 daies subs. end. 28 instant incl. out of 2 mons [millions].” 1 page (quarto). 40. Letter of Mr. Wm. 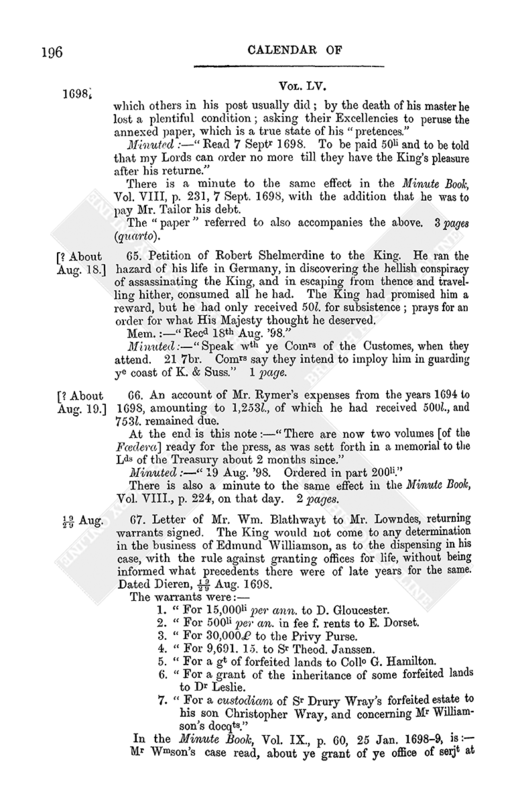 Blathwayt, Secretary at War, to Mr. Lowndes, enclosing a warrant signed by the King, granting a pension of 100l. per ann. to Lieut.-Col. Gilby, payable by the Earl of Ranelagh, for the signature of their Lordships. Dated Loo, 11/21 Aug. 1698. 1 page (quarto). 41. Petition of Anne Bowtell, widow of William Bowtell, deceased, for the payment of 304l. due on account of her husband's service, in redeeming English captives. Recd 11 Augt '98. Minuted:—“50li was ordered.” 1 page. 42. 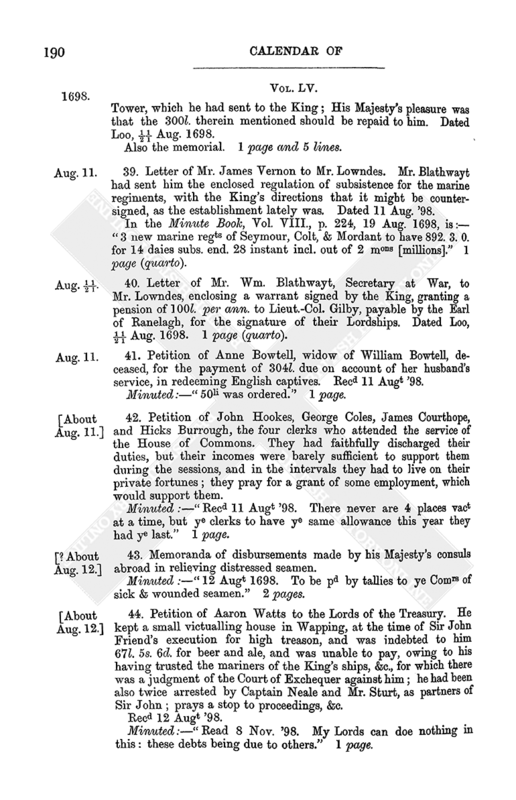 Petition of John Hookes, George Coles, James Courthope, and Hicks Burrough, the four clerks who attended the service of the House of Commons. They had faithfully discharged their duties, but their incomes were barely sufficient to support them during the sessions, and in the intervals they had to live on their private fortunes; they pray for a grant of some employment, which would support them. Minuted:—“Recd 11 Augt '98. There never are 4 places vact at a time, but ye clerks to have ye same allowance this year they had ye last.” 1 page. 43. Memoranda of disbursements made by his Majesty's consuls abroad in relieving distressed seamen. Minuted:—“12 Augt 1698. To be pd by tallies to ye Comrs of sick & wounded seamen.” 2 pages. 44. Petition of Aaron Watts to the Lords of the Treasury. He kept a small victualling house in Wapping, at the time of Sir John Friend's execution for high treason, and was indebted to him 67l. 5s. 6d. for beer and ale, and was unable to pay, owing to his having trusted the mariners of the King's ships, &c., for which there was a judgment of the Court of Exchequer against him; he had been also twice arrested by Captain Neale and Mr. Sturt, as partners of Sir John; prays a stop to proceedings, &c.
Minuted:—“Read 8 Nov. '98. My Lords can doe nothing in this: these debts being due to others.” 1 page. 45. Petition of Luke Nightingale to the Lords of the Treasury. He had supplied Col. Windsor's regiment with regimental clothing; prays that the money might be paid out of the officers' half-pay, by reasonable monthly payments, to prevent his ruin. Received 12 Aug. '98. Minuted:—“28th June 1698. [Thus in orig., but query a mistake for 1699.] Referred to Ea. Ranelagh.” 1 page. 46. Articles exhibited by Mr. Bauden against Mr. Dockwra for mismanagement of the penny post, &c.
Minuted:—“12 Aug. '98. His articles to be sent to M. Dockwra, and Dockwra to make answer in writing; then my Lords will hear both sides.” 1 page. 47. “Navy lr~e to Mr. Lownds for navall stores for the Streight's squadron to pass custome free.” Dated 13 Aug. '98. Also an enclosure and a copy of a letter of the Comrs of Customs respecting the said stores. Minuted:—“19 Aug. 1698. The warrt for this ship, and speak with the Comrs of ye Customs to make a future settlement in this matter.” “1st Sepr '98. To apply as there is occasion.” 4 pages. 48. Report signed “Hen. Baker,” to the Lords of the Treasury, on the case of Wm. Nayler, now a prisoner in the common side of Newgate, who was indicted at Hicks's Hall for a trespass in going into a house near Tottenham High Cross, with an intention (as was supposed) to rob. Dated 13 Aug. 1698. Minuted:—“Read 6 8br 1698. My Lords do not see any reason to release this person.” 1 page. 49. 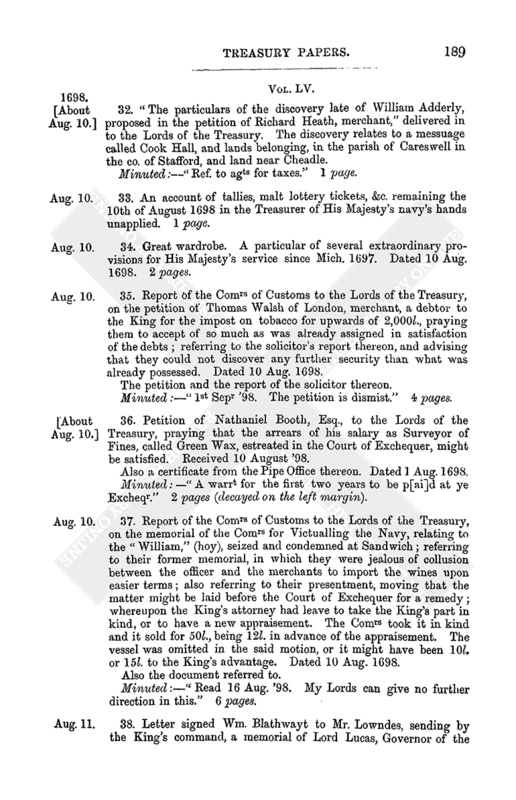 Report of the Comrs of Customs to the Lords of the Treasury, on the petition of Giles Been, praying for directions to be given for the entry of a noli prosequi. It would be hard to insist on the forfeiture of the ship for so small a quantity of wine, and they would not object to any favour to the petitioner. Dated 15 Aug. 1698. Minuted:—“1st Sepr '98. Respited.” Again:—“Ordered.” 2 pages. 50. Report of the same to the same, on the memorial of Mr. Villers, a searcher at Gravesend, approving the appointment of Mr. Middleton as his deputy, in place of Mr. Villers. Dated 15 Aug. 1698. Minuted:—“1mo Septr. Agreed. Wt signed.” 1½ pages. 51. Report of the same to the same, on the petition of Jeffry Jeffries [or Jeffreys], Esq., and William Read, commander of the ship “Canterbury,” from Cadiz, who had transgressed the navigation laws, in bringing goods from Algiers, as they said, by persuasion of the Dey and people there, to invite a trade with them. They would not object to the goods from Cadiz being entered, and the others being exported, satisfaction being made to the officer, and they would not object to the entry of the noli prosequi, as desired. Dated 15 Aug. 1698. The petition referred to, which always speaks of the ship coming from “Cales.” Also another petition by the said Jeffreys. Minuted:—“1st Sep. '98. To speak with Mr Attorney or Sollicitor Genl.” 4 pages. 52. Letter by command of the Lords Justices, transmitting the petition of Capt. Martin Laycocke, for directions and relief. Dated 16 Aug. 1698. Also the petition, which shows that he went to Ireland with Duke Schombourgh, and was at the camp of Dundalke, and all the “balls” [? battles] and sieges in Ireland, and received four musket shot wounds, “to the great effusion of his blood and substance,” for which he was ordered a pension of 100l. per ann. out of the Royal Oak Lottery, but could receive nothing till some of the former pensioners died; since which Lady Catherine Armstrong and Sir John Osborne died, their pensions being 300l. per ann. ; he further raised a company in Lord Charlemont's regiment and borrowed the money to raise it: he marched the company 700 miles, not receiving his levy money for a year and a half, &c. He was then prisoner for these moneys, there being 985l. due to him; praying for so much of his arrears as would bring him out of that place, &c. Signed. The minute for this payment is entered in the Minute Book, Vol. VIII., p. 238, 15 Sept. 1698. There is also another petition, and a schedule of what was due to him, &c.
Minuted:—“10 Aug. '98. The parliamt hath made no provision as yet for ye Irish arrears.” 6 pages. Minuted:—“200li in part of ye mo[ney] due to her upon account to be paid out of loans on the poll.” 2 pages. 54. Report of the Comrs of Customs to the Lords of the Treasury, advising their Lordships as to what orders it would be necessary for them to give for the effectual putting in execution an Act passed in the last session to prevent the exportation of wool. They had written to the collector of Berwick, to make particular inquiries upon the Scotch borders, as to all roads and ways from England to Scotland between Berwick and Carlisle, &c.; further, they had sent a circular letter to the officers of the coast of Kent and Sussex, and when they received replies thereto, they would be better enabled to give an opinion; they had also been in correspondence with the Comrs of Revenue in Ireland. Dated 16 Aug. 1698. In the Minute Book, Vol. VIII., p. 219, 16 Aug. 1698, is:—“Comrs of ye Customes & Mr Baker. The order of Counsell of 23 Jun. '98, agt the owlers is read. The minutes are upon it. Instructions to be sent to ye Comrs of Customes accordingly. My Lords discourse ye Comrs upon a scheme of theirs for better guarding the coast round England. My Lords direct them to finish it & present the same to my Lords. Mr Sansom to bring a scheme of ye method practiced when the prohibition of French goods was first made.” 1 page. 55. 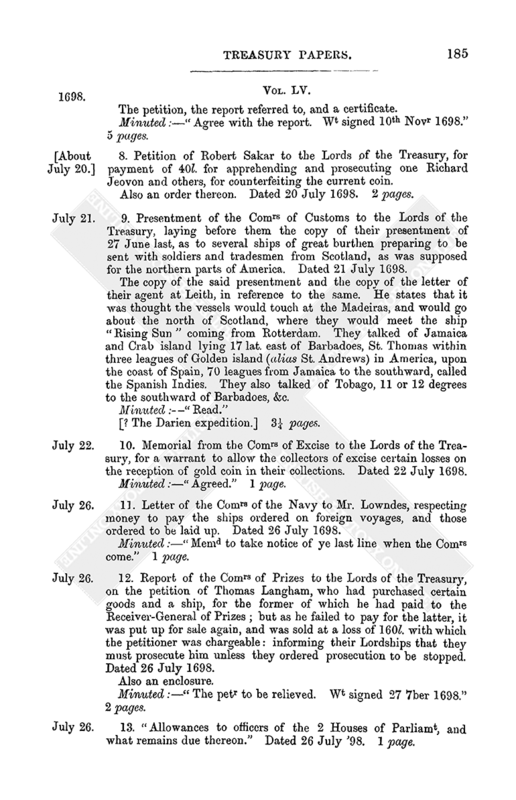 Report of Mr. John Sansom to the Lords of the Treasury, on the petition of Thomas Ward, master of the ship “Yarmouth,” who, whilst attending the royal navy in the Straights, had bought of the King's agent and Comrs for Prizes at Cadiz, a parcel of prunelloes, which he brought from thence to England, and entered at Deal, and on their arrival at London they were seized as French goods, &c. Referring to proceedings thereon, and certifying that they were chargeable at the time of importation, with the old subsidy and the impost granted 4 & 5 Will. and Mar., which duties were appropriated, so that the petitioner was altogether without relief from the favour intended him, viz. the King's share of the forfeiture. Dated 16 Aug. 1698. Accompanied by the case and the petition of the said Ward. Minuted:—“Read 21 7br. 1698. My Lords can give noe further relief in this case.” 6 pages. 56. The second, third, fourth, and fifth reports presented to the Lords of the Treasury by Wm. Clayton and Lionel Herne, who were appointed to inquire into the matter of fact in respect to several Exchequer bills that appear to have been counterfeited. To the fourth report there is a memorandum appended, that upon their Lordships' order directing Mr. Herne, when he went to Bedford gaol, to offer a pardon to any person concerned who should make a full discovery; he had assured James Wiseman alias Benjamin Cole of their Lordships' favour, he having been the first and principal occasion of their obtaining a perfect discovery. If their Lordships thought fit, he might be the principal evidence against the rest, although he had acted so cunning and villanous a part in that affair, that he was not fit to be trusted abroad again in this nation. With the fifth report are the examinations of Isaac Cooper, Centurian Lucas, and Thomas Abraham. The first of these is dated 23 June and the last 16 Aug. 1698. They contain information upon the cutting of counterfeit plates, &c. 17 pages and 3 halves. 57. Petition of James Burges[s] to the Lords of the Treasury. He was employed as assistant to the “register” in judicial proceedings of the Comrs of Excise, and was afterwards employed in making out a list of fines and forfeitures adjudged by the Comrs of Excise against brewers, &c.; praying for a suitable satisfaction. Again at p. 198, 24 Oct. 1699:—“Comrs of Excise called in, wth Mr Noel & Mr Thompson. The petitions of Thompson & Burgess are read. Noel saies he never had any constitution, but the patent for Register, and when he was turned out he had nothing more to doe; calling him secry was nothing but curtesy, he did all as register. That the offices of regr & secry are all one, and the office of regr was granted to him for life; and the reason why he doth not meddle wth his salla[ry] is because he is turned out, but he thinks himselfe entitled to the office still. Mr Thompson saies, in the patent it's said, they had been secrys, & it grants to them the office of regr.” 1 page. 58. Presentment of the Comrs of Transportation, as to the amounts due to them, viz., 50,217l. 11s. 1d. ; also as to bills of exchange running upon them for upwards of 6,000l., which had been due several months, &c.; praying for a supply. Dated 17 Aug. 1698. 1 page. Minuted:—“23 Nov. '98. When any further part of ye Flanders subsistence is paid this shall be taken care of.” 3 pages. 60. Petition of Nicholas Green, merchant, to the King. At the siege of Cork, he, at the hazard of his life, guided the forces over that part of the sea which encompassed the East Marsh, whereupon the garrison capitulated, and he performed other services, he took charge of a freight of provisions to be transported to Cork, but the crew, without his knowledge, carried the ship and cargo into France; on which he was tried for high treason, but acquitted, notwithstanding which, there was a judgment against him for 1,115l. 10s. 5d. damages, on which he lay in prison: prays for his discharge, and that further prosecutions against him might cease. “Mr Attor. & the Victrs concerning the business of Nicho Green, make a report that Green, or any on his behalfe, have not appeared to shew cause why the prosecution agt him for the value of a lading of provisions carryed away for France should be stopt, and upon discourse wth Mr Attor. & the Comrs of Victualling, my Lords are induced to think Green a very ill man, that he with others contrived the carrying away the ship, & that it is their Lops opinion order be sent into Ireland to prosecute him effectually for ye value of the said provisions.” 1 page. 61. Estimate of the charge of provisions for 800 men for seven days from Portsmouth to Jersey and Guernsey. Dated 18 Aug. 1698. Minuted:—“Out of ye 2 millions. ½ page. 62. Report of Isaac Newton and Thomas Neale, officers of the Mint, to the Lords of the Treasury, on the petition of John Roettiers and James Roettiers, late engravers of the Mint in the Tower of London; finding that the three brothers John, Joseph, and Phillip Roettiers were gravers to the Mint from 1661, at an allowance of 325l. a year, and in 1669 by a new grant they were allowed 450l. yearly as gravers of the coin and medals; after the death of one, the two survivors to receive 350l. yearly, and the survivor to receive 250l. yearly for life: about 1680, Joseph went off, but the pay continued (as they supposed), because James the son of John supplied the place; Phillip went off in Feb. 1684, but John having another son “Norbertus,” the whole allowance of 450l. continued till March 25, 1697: they believed the petition was true as to their wants and the capability of James Roettier to make medals, and that he deserved the King's favour. Dated 18 Aug. 1698. Minuted:—“½ a year to be p[ai]d.” 2 pages. 63. Petition of Joshua Tayler, excise officer in Bristol, to Charles Montague, Esq., for removal to any part of Middlesex, on account of his wife's health. Signed by the churchwardens. Minuted:—“Recd 18th Augt '98.” 1 page. 64. 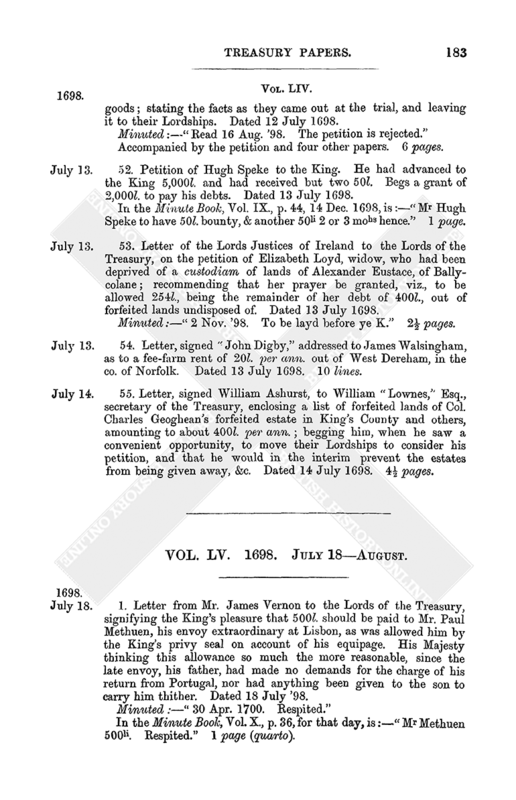 Letter by command of the Lords Justices to the Lords of the Treasury, enclosing the petition of Mr. Henry Killegrew, and stating their desire that some provision should be made for so old a servant of the Crown. Dated 18 Aug. 1698. There is a minute to the same effect in the Minute Book, Vol. VIII, p. 231, 7 Sept. 1698, with the addition that he was to pay Mr. Tailor his debt. The “paper” referred to also accompanies the above. 3 pages (quarto). 65. Petition of Robert Shelmerdine to the King. He ran the hazard of his life in Germany, in discovering the hellish conspiracy of assassinating the King, and in escaping from thence and travelling hither, consumed all he had. The King had promised him a reward, but he had only received 50l. for subsistence; prays for an order for what His Majesty thought he deserved. Minuted:—“Speak wth ye Comrs of the Customes, when they attend. 21 7br. Comrs say they intend to imploy him in guarding ye coast of K. & Suss.” 1 page. 66. An account of Mr. Rymer's expenses from the years 1694 to 1698, amounting to 1,253l., of which he had received 500l., and 753l. remained due. There is also a minute to the same effect in the Minute Book, Vol. VIII., p. 224, on that day. 2 pages. 67. Letter of Mr. Wm. Blathwayt to Mr. Lowndes, returning warrants signed. The King would not come to any determination in the business of Edmund Williamson, as to the dispensing in his case, with the rule against granting offices for life, without being informed what precedents there were of late years for the same. Dated Dieren, 19/29 Aug. 1698. 1. “For 15,000li per ann. to D. Gloucester. 2. “For 500li per an. in fee f. rents to E. Dorset. 3. “For 30,000£ to the Privy Purse. 4. “For 9,691. 15. to Sr Theod. Janssen. 5. “For a gt of forfeited lands to Collo G. Hamilton. 6. “For a grant of the inheritance of some forfeited lands to Dr Leslie. In the Minute Book, Vol. IX., p. 60, 25 Jan. 1698–9, is:—Mr Wmson's case read, about ye grant of ye office of serjt at armes. The King will change this life, because this patent of old Mr Wmson is already surrendred, and for no other reason.” 1 page (quarto). 68. Petition of Percival Brunskell, gent., to the Chancellor of the Exchequer and the rest of the Lords of the Treasury. The King made an order of reference to their Lordships for an office or pension, but their Lordships put him off with 20l. in malt tickets, which he was forced to sell for 16l. to pay the butcher, &c., and the 20l. then ordered him only paid his rent. He could get no employment, being looked upon with aversion by all in authority; and their Lordships had passed sentence on him to expect no more. His debts exceeded 3,500l., and exposed him to the cruelties of the mercenaries, with whose practices his discoveries and proposals interfered. For this reason he had petitioned the Lords Justices, that in case they would not, in the King's absence, order money to pay his debts, and a pension of 300l. per ann. for his own, his daughter Mary's, and his brother Francis' lives, to be paid as Mr. Oats had his settled, that they would give order for 50l. for subsistence till the King's return. His petition was returned, and the Lord Chancellor's opinion was that the application would be more proper to the Lords of the Treasury. The oaths taken by the petitioner were enjoined to be taken by all in public employments. He was at first encouraged upon his discoveries by King Charles II. He obtained nothing but the office of surveyor of the Greenwax fines, and a comrs place in the Alienation Office, and was miserably oppressed therein, till the King died. The present King more than once signified his pleasure that he should have those offices, being worth 510l. per ann., but the Chancellor of the Exchequer and Mr. Jepson gratified their friends therewith. His debts might have been paid from that income, or if their Lordships' predecessors had done him justice when they sent him to Parliament with his discoveries and proposals. Several committees of the House of Commons had reported him worthy of reward, the judges and officers having made him consume his own estate, above 1,500l., and destroyed his practice, when he got above 300l. per ann., by practising in attorney's names, as many did; before he was compelled by the statute 3 Jac. I. cap. 7, to take the oaths to make discoveries and proposals; prays that they would make his conditions easy. Accompanied by a letter from him to Mr. Lowndes, in which he says he knows that the “Ld Chancellor loves the Lds of the Treasury,” and his Excellency, having a kindness for him, advised him to apply again and again to the Lords of the Treasury; the very words of the oaths he was compelled to take, or incur a premunire, were that he would do no falsehood or wrong, or consent to any, but if he knew any, to inform the King or some of his ministers. He had sustained great loss and damage by the debaucheries of the Government and its own acts; he hoped the Government, “being civilized,” would relieve him. His brethren were most inexcusable, in oppressing him, because he would not dispense with oaths to wink at them for dispensing with theirs; if God had a favour for them, they would turn and repent; if not, he would harden their hearts, as he did the Egyptians, until they perished. He continues:—“Nothing more eclipseth the glory of His Maty's administration, than neglecting petitioners well entitled to the bounty of the Government, and nothing will more redound to the honor of ye Lds Comrs than promoting His Matys bountiful intentions to me after 24 years persecution, that I may be easy in my old age.” Dated 19 Aug. 1698. In the Minute Book, Vol. X., p. 23, for 13 April 1700, is the following:—“If Mr Percival Brunskel will accept 50£, and promise never to importune the K., or trouble this office any more, my Lords do order ye said sum, to enable him to go to New York.” 2 pages. 69. Presentment of the Comrs of Excise to the Lords of the Treasury, as to the imposts on vinegar and vinegar beer. Dated 20 Aug. 1698. Minuted:—“Comrs to advise wth Mr Att. & Mr Sollr about this.” 2 pages. 70. Report signed Mord. 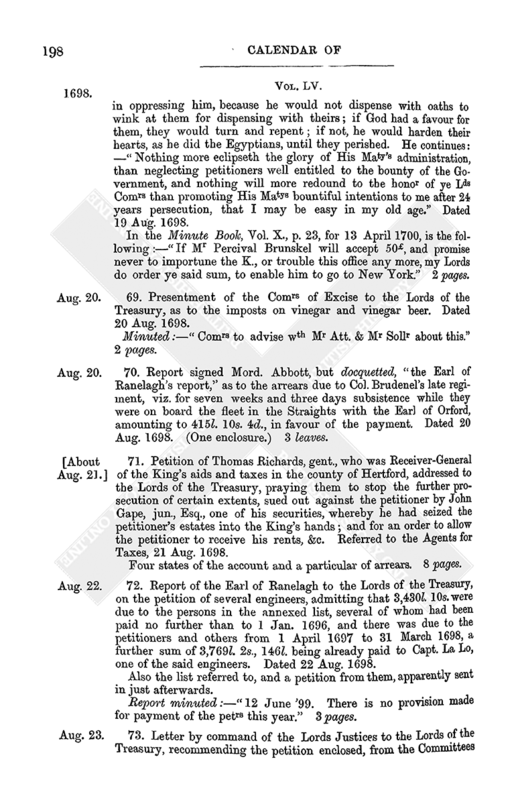 Abbott, but docquetted, “the Earl of Ranelagh's report,” as to the arrears due to Col. Brudenel's late regiment, viz. for seven weeks and three days subsistence while they were on board the fleet in the Straights with the Earl of Orford, amounting to 415l. 10s. 4d., in favour of the payment. Dated 20 Aug. 1698. (One enclosure.) 3 leaves. 71. Petition of Thomas Richards, gent., who was Receiver-General of the King's aids and taxes in the county of Hertford, addressed to the Lords of the Treasury, praying them to stop the further prosecution of certain extents, sued out against the petitioner by John Gape, jun., Esq., one of his securities, whereby he had seized the petitioner's estates into the King's hands; and for an order to allow the petitioner to receive his rents, &c. Referred to the Agents for Taxes, 21 Aug. 1698. Four states of the account and a particular of arrears. 8 pages. 72. Report of the Earl of Ranelagh to the Lords of the Treasury, on the petition of several engineers, admitting that 3,430l. 10s. were due to the persons in the annexed list, several of whom had been paid no further than to 1 Jan. 1696, and there was due to the petitioners and others from 1 April 1697 to 31 March 1698, a further sum of 3,769l. 2s. 146l. being already paid to Capt. La Lo, one of the said engineers. Dated 22 Aug. 1698. Also the list referred to, and a petition from them, apparently sent in just afterwards. Report minuted:—“12 June '99. There is no provision made for payment of the petrs this year.” 3 pages. 73. 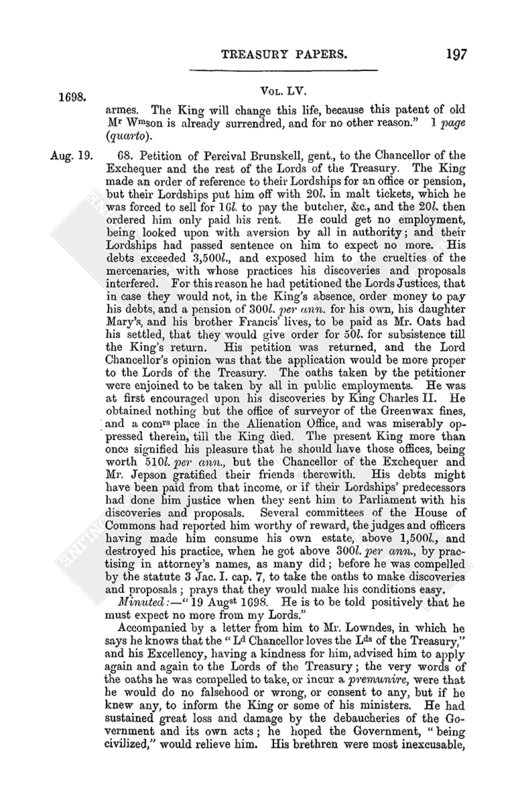 Letter by command of the Lords Justices to the Lords of the Treasury, recommending the petition enclosed, from the Committees of the French Churches, pressing for speedy payment of the 15,000l. granted them by royal charity. Dated 23 Aug. 1698. In the Minute Book, Vol. VIII., p. 227, 2 Sept. 1698, is:—“Mr Nicholas, ye late Queen's treasurer, called in. 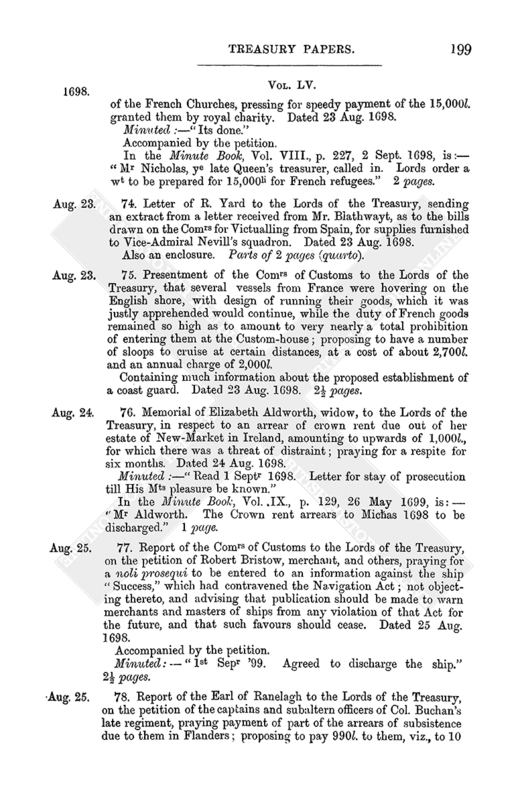 Lords order a wt to be prepared for 15,000li for French refugees.” 2 pages. 74. Letter of R. Yard to the Lords of the Treasury, sending an extract from a letter received from Mr. Blathwayt, as to the bills drawn on the Comrs for Victualling from Spain, for supplies furnished to Vice-Admiral Nevill's squadron. Dated 23 Aug. 1698. Also an enclosure. Parts of 2 pages (quarto). 75. Presentment of the Comrs of Customs to the Lords of the Treasury, that several vessels from France were hovering on the English shore, with design of running their goods, which it was justly apprehended would continue, while the duty of French goods remained so high as to amount to very nearly a total prohibition of entering them at the Custom-house; proposing to have a number of sloops to cruise at certain distances, at a cost of about 2,700l. and an annual charge of 2,000l. Containing much information about the proposed establishment of a coast guard. Dated 23 Aug. 1698. 2½ pages. 76. Memorial of Elizabeth Aldworth, widow, to the Lords of the Treasury, in respect to an arrear of crown rent due out of her estate of New-Market in Ireland, amounting to upwards of 1,000l., for which there was a threat of distraint; praying for a respite for six months. Dated 24 Aug. 1698. In the Minute Book, Vol. IX., p. 129, 26 May 1699, is:—“Mr Aldworth. The Crown rent arrears to Micħas 1698 to be discharged.” 1 page. 77. Report of the Comrs of Customs to the Lords of the Treasury, on the petition of Robert Bristow, merchant, and others, praying for a noli prosequi to be entered to an information against the ship “Success,” which had contravened the Navigation Act; not objecting thereto, and advising that publication should be made to warn merchants and masters of ships from any violation of that Act for the future, and that such favours should cease. Dated 25 Aug. 1698. Minuted:—“1st Sepr '99. Agreed to discharge the ship.” 2½ pages. In the Minute Book, Vol. VIII., p. 236, 14 Sept. 1698, is:—“1,600li, vizt 800li to each of ye regts of Buchan & Lorne disbanded, in part of their arrear of subsistence growne due in Flanders.” 2 pages. 79. Letter signed Charles Thomas, addressed to the Lords of the Treasury, respecting the advance of money for victualling the King's ships, the sale of prize goods, &c. Dated at Barbadoes, 25 Aug. 1698. 2½ pages. 80. 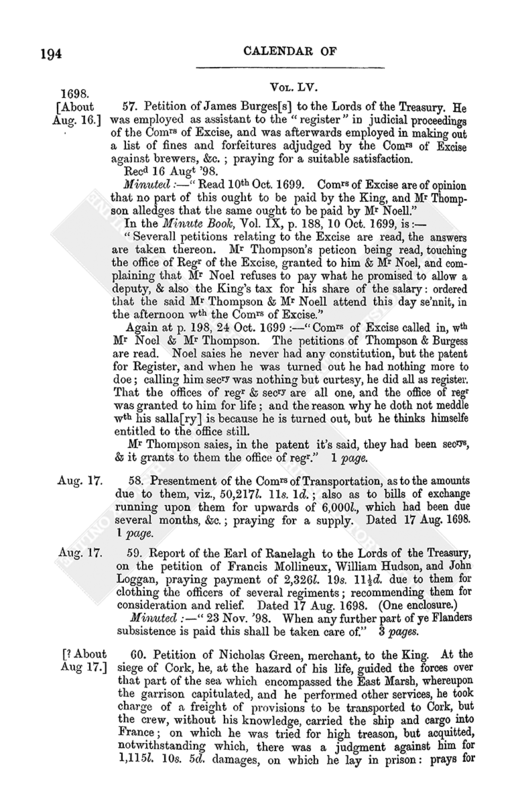 Report of the Comrs of Customs to the Lords of the Treasury, on the petition of Richard Earl Rivers to the King, praying in regard of the late loss at sea, of his plate, horses, and other equipage prepared for his campaign in the King's service (amounting to a very considerable sum), and on account of his faithful services to His Majesty, that he might have a grant of the debt of Michael Wicke, late receiver of the impost on tobacco; informing their Lordships that the debt seemed to be upwards of 30,000l., and making other statements in relation to his debt, and offering no objection to His Majesty's bounty to the petitioner, out of such part of Mr. Wicke's estate, as was not already extended, if the present appropriations did not hinder. Dated 25 Aug. 1698. The petition and a report by John Bridges [their solicitor] on the same subject. Minuted:—“1st Sepr '98 Read. 21 7br. 1698 To be layd before ye K. 26 May '99. Read.” 5 pages. 81. Letter of Mr. Wm. Blathwayt to Mr. Lowndes, for a warrant to be prepared and sent for signature for 1,020l. to be paid to the Comte Frise, whom the King had continued in his service at the rate of 5l. a day from 8 Feb. (to which time he was last paid) to 1 Sept., payable out of the secret service money; with a postscript that the King thought fit to employ him as envoy extraordinary in Germany. Dated Loo, 5 Sept. 1698, N.S. 1 page (quarto). 82. Letter of Mr. Wm. Blathwayt to Mr. Lowndes, sending the King's directions for the payment of one year's pension to the Duchess of Mazarin, “which (he says) you know is in ye name of the Duke of Devonshire.” Dated Loo, 5 7br. 1698, S.N. There is a letter for payment of this, dated 30 Sept. 1698, in the Letter Book, Vol. X. p. 40. Part of a page (quarto). 1. “For appting Comrs for stampt papers, &c.
2. “For appting Mr Pennyman recr thereof. 3. “For discha Sr B. Firebrace of 1,095l. 4. “For 260l. to be paid to ye Ld Cornbury.” Parts of 2 pages (quarto). 84. 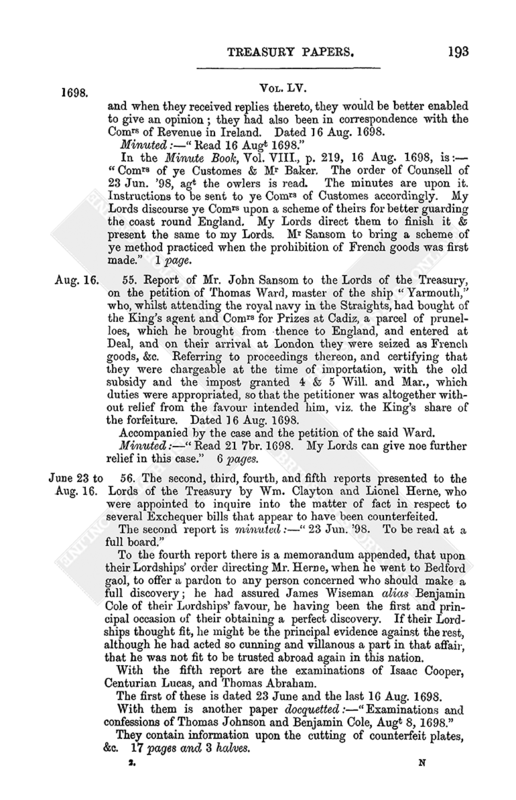 Presentment of the Comrs of Customs to the Lords of the Treasury, in respect to an intimation given them from a French gentleman that the ship “Providence,” lately arrived in the Downs from Genoa, had taken in a great part of her lading at Marseilles, although the goods were intended to be imported as Italian goods; which information they found to be correct, being corroborated by the seamen; recommending that they should be rewarded out of the 25 per cent., or 25l. per ton. Dated 31 Aug. 1698. Minuted:—“1st Sepr '98. The Comrs to propose what may be fit to be allowed the informer.” 2 pages. 85. 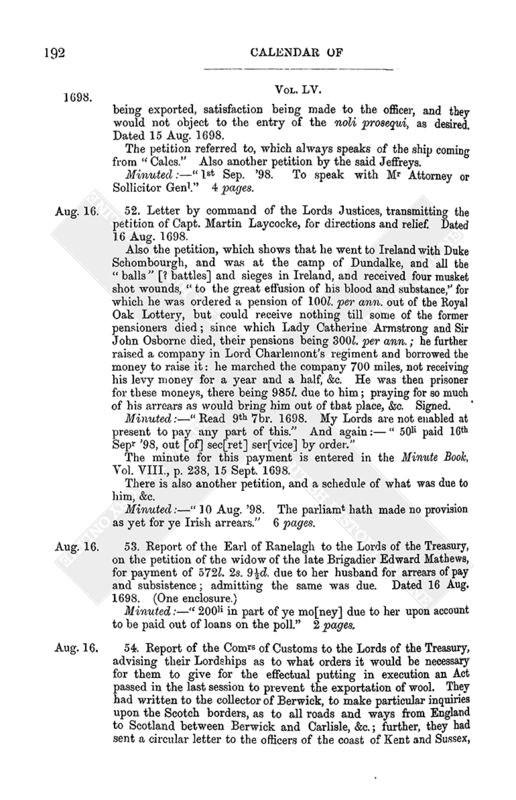 Petition of Mary Piggatt, widow, to the King, showing that her husband was a captain of dragoons in the garrison of Londonderry during the siege there in the late war in Ireland, and that they were suddenly deprived of goods and cattle to the value of 700l. 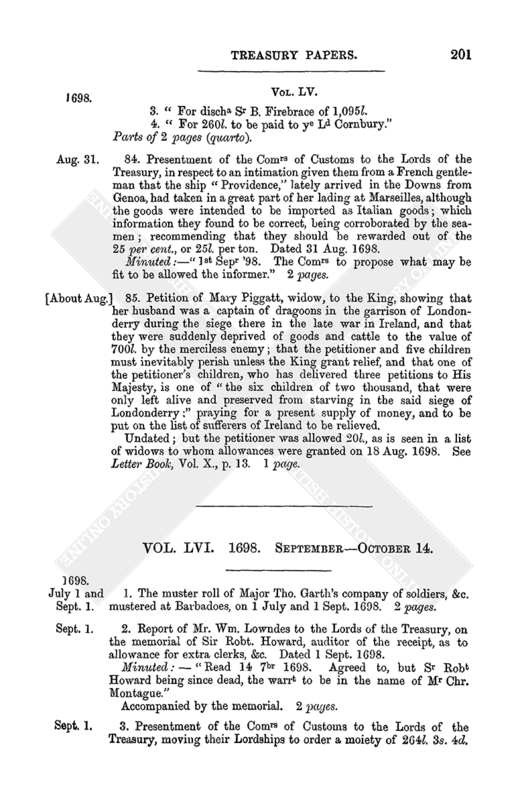 by the merciless enemy; that the petitioner and five children must inevitably perish unless the King grant relief, and that one of the petitioner's children, who has delivered three petitions to His Majesty, is one of “the six children of two thousand, that were only left alive and preserved from starving in the said siege of Londonderry;” praying for a present supply of money, and to be put on the list of sufferers of Ireland to be relieved. Undated; but the petitioner was allowed 20l., as is seen in a list of widows to whom allowances were granted on 18 Aug. 1698. See Letter Book, Vol. X., p. 13. 1 page.